The Nut-Free Mom Blog: Peanut Allergy News: Thanksgiving Savings from Vermont Nut Free Chocolate!! Thanks for sharing! I am also a Vermont Nut Free fan. I love Vermont Nut-Free! 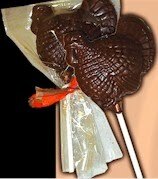 Their chocolate covered pretzels and marshmallows on a stick are my favorites. But honestly... you can't go wrong!